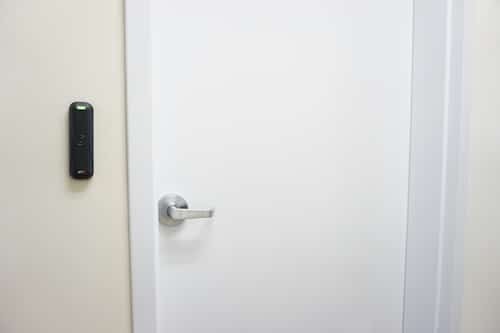 Buckley’s Securitysmiths is a security door installation specialist company. We serve Colonial Heights, VA, with a full lineup of door installation services in addition to our professional locksmith services. Your home or commercial property’s exterior doors are your first line of defense against intruders. We can provide you with a consultation service to help you select the right doors and applications for your space. From fiberglass doors to steel doors, new doors require expert installation to ensure that they can provide you with the reliable protection you need. This Door Installation job required a hollow metal commercial door with hollow metal frame. The professional locksmiths and installers at Buckley’s Securitysmiths can assess any door and help our customers choose the best doors for their setting. We can handle all of your door installation needs. There is a myriad of entry doors and security doors on the market today. We can help you choose doors that suit your home or business. We can even help you source the types of doors and locks you’re looking for. With so many different doors available today from wooden doors to metal doors, it can be difficult to know what to choose. We stay on top of all the latest security updates to door and lock products. We can discuss different doors along with their pros and cons. If you’re looking for a high-security door that boasts the look of a vintage wood door, we can help you find the door you’re interested in. Many manufacturers are now designing their security doors to resemble traditional or chic-contemporary door styles. In other words, you don’t have to sacrifice looks and curb appeal when installing new doors for your home or business. Buckley’s Securitysmiths feature experienced installers and locksmiths who have the expertise needed to professionally install or repair your door. We can inspect your door frame for any necessary repairs and discuss the different types of installation you might choose. While many customers in Colonial Heights, VA, opt for lock replacement at the time of the new door installation, we can reuse your door hardware. Our pros can answer your questions and help you choose what’s best for you. Each of our locksmiths and door installers has the experience and expertise required to deliver our services. We screen our employees to make certain they have the background and professional skills needed for the job. They are friendly, reliable, and eager to provide our customers with the high-quality service they deserve. If you are considering a new security entrance door, new commercial doors, or storm doors for your business or home, contact Buckley’s Securitysmiths for our competitively priced services. Our goal is to help you achieve the level of security you need to ensure peace of mind. Call us today and set up an appointment to discuss your security and door installation needs.